"A very happy birthday to you, my dear hubby. May you have blissful days ahead and enjoy the life together with me"
…. As both of us are working today, we will only be celebrating it on coming weekend. There are a few special days for us in December and we’ve just celebrated our very special day not too long ago. To be exact, it was on last Monday. 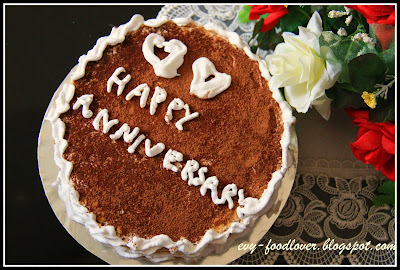 Yes, it was our 1st Anniversary which fell on 14 December. 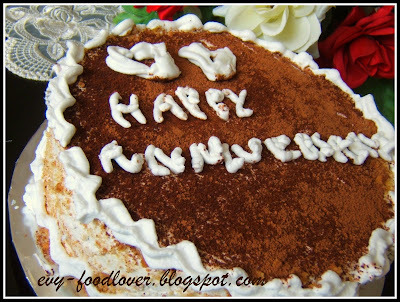 Since the two special days, birthday and anniversary, are quite near, I just baked only one cake for both days. 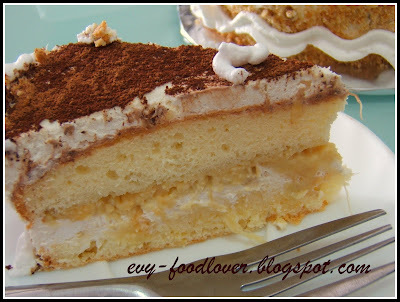 And you know what, the cake is also my very first layer cake. 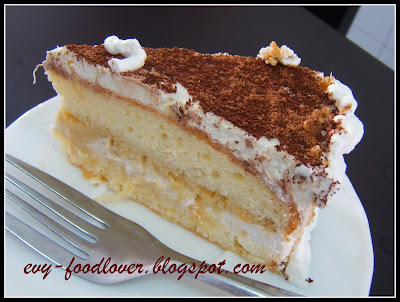 It was a Durian layer cake. Yeah I knew it should be a chocolate cake for these occasions, as a representation of romance and love but I still decided to bake a Durian cake as I wanted to try it out as my first layer cake. I am a kinda stubborn person sometimes :D .
As you can see in the pictures, my decorating skill is quite poor. But, I think it is still acceptable as a very first trial. * convincing myself* lol. But, seriously, more practices are required. OK , well, enough of talking, here is the recipe and method. In a mixer,whisk egg yolks until smooth and creamy. After 1 minute, add 2 Tbs of sugar and continue to mix until thick mixture is formed. Transfer the mixture into a bowl and set aside. Whisk egg whites together with vanilla extract until white and frothy. Add remaining sugar and continue to mix until stiff. Fold in number (1)into egg white mixture gently. milk into the batter .Mix well after each addition. Pls take care not to deflate the mixture. Pour the batter into 16cm baking pan (round) and bake in 180 degree C preheated oven for 30 mins. Remove from oven and leave it to cool. Whip the cream for about 2 minutes. Mix well with blended Durian flesh. 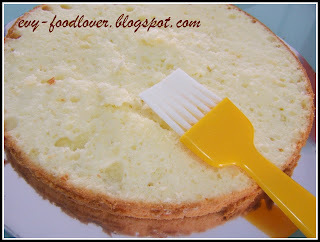 Slice the cake (horizontally) into 2 layers. 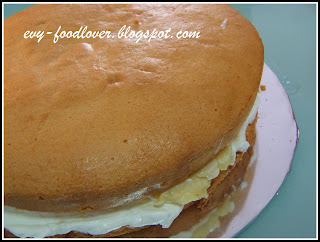 Spread the cream-Durian mixture on the 1st layer and cover with 2nd layer. Chill in the fridge for about 3 hours before serving. Slice the cake and serve. Enjoy! I love sponge cat. Yours looks fantastic! The cake looks delicious. What is Durian? Hi Kris and Moogie, thanks for dropping by! Durian is a kind of tropical fruit which can be found in Southeast Asia.